When wanting to get your vehicle prepared for harsh weather conditions the 57Z-VSS complete vehicle specific ready remote starter & keyless entry system with it's step-by-step system-to-vehicle installation manual will guide you to getting the job done faster & easier! The 57Z-VSS™ remote starter with keyless entry system will provide you with the convenience of locking and unlocking your vehicle's doors with the luxury of pre-warming up your engine and interior while defrosting your windshield all by remote control from up to 1500' away. And in warmer weather, just pre-set your AC to pre-cool the interior after a hot day of it sitting in the sun! The 57Z-VSS™ includes two chromed-metal reinforced 3-button remotes that will withstand the daily wear & tear of hanging by your keychain and provide optimum performance that get's up to 1500 feet of remote starter range. Remotely lock or unlock all your vehicles doors from up to 1500' away. The system will silently lock and unlock the vehicle's doors on the first press of the button and send a quick pulse to your vehicles horn for sound confirmation on the 2nd press of the button, and sound when the remote starter is activated. Remote start confirmation can also be turned off separately. Visual confirmation that you activated the remote starter and when you lock or unlock the vehicle's doors: The system will flash the vehicles parking lights when you lock or unlock the doors and right after you activate the remote starter. After remote start activation it will turn the parking lights on solid shortly afterwards to confirm that the vehicle is running via the remote starter. The remote starter is activated by pressing the remote start button on the remote 2X within 3 seconds. This setting helps to prevent any accidental activation that could occur with a single press activation setting. Pre-setting your vehicle's heat settings prior to exiting your vehicle will enable you to pre-warm the interior and defrost the windshield when your vehicle is running via the remote starter. Same with the vehicle's AC, just pre-set the AC settings where you like it and it will pre-cool the interior on those hot days from it sitting in the sun. The system will be set-up for you with whatever run time you want thats available: Your choices will be 5, 10, 15, 20, 45 or 60 minutes. You can order the system pre-set with any one of these times. 15 minutes is the industry standard. You can easily change the run time yourself anytime after installation. A cool feature that allows you to keep the engine running without leaving the keys in the ignition: While the engine is still running with the keys, just press the remote start button on the remote 2X, and when you turn off the ignition and remove the keys to exit the vehicle, the engine, heat or AC will remain running for the duration of the current remote start run time (or you can press the button on the remote 2X again to shut it down sooner). Mandatory connection that will immediately shut down the remote starter system if you step on the vehicle's brake pedal before you put the key's into the ignition and turn the ignition on (a.k.a. "key-take-over" feature). The system has a valet mode where the remote start feature can be temporarily turned off. Mainly used when servicing the vehicle. Commonly mounted on the inside center of the vehicle's windshield directly behind the rear-view mirror for best range, the antenna conveniently incorporates both the system's programming button and status LED. This eliminates any hole drilling in the vehicle and significantly reduces the amount of wire's needed to be run under the dash during installation. Press & holding the remote's trunk button for over 3 seconds will activate your vehicles power trunk (or hatch) release circuit if your vehicle is equipped with a separate factory power trunk or hatch release push button. Press & holding either the lock or unlock button on the remote for over 3 seconds will activate the car finder feature that will flash the vehicle's parking lights and pulse the vehicles horn. Great for locating your vehicle in crowded parking lots. Programmable crank delay settings for Diesel engines. The system will be pre-set for you with any of the pre-set times available. Your choice of "wait-to-start" times are: 10, 15, 20 or 45 seconds before crank to allow for proper glow-plug warming. 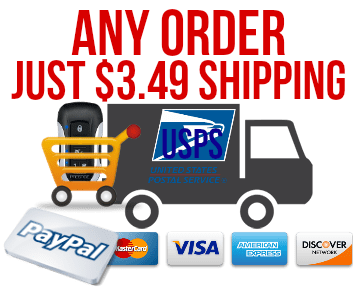 The system has the ability to work with one or two additional remotes for a total of up to 4 remotes at the same time (Additional remotes are offered at a discount w/system purchase during checkout). 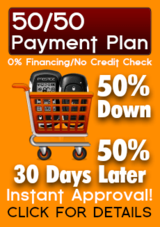 ► 3 Year "VIP" Warranty: We have the best warranty coverage ever! In the rare event that you have a problem with your system within 3 years, just contact our technical support dept. and after they determine the problem, they will email you a return shipping label for the defective part and ship you the repaired or replacement part within 24-48 hours of receiving the defective part at no cost to you! Out of warranty? You will still have lifetime tech support and be provided with a VIP 10% discount on any replacement parts you have out of warranty! And your new part will come with a new warranty! All our VSS™ kits arrive at your door complete with all the parts and information you'll need to install the system into your specific vehicle. The only DIY kits with 50% of the DIY already done for you! Have the VSS Advantage™ on your installation today. No sitting with a lap-full of "spaghetti-wire" and jumping from wiring chart to manual, trying to figure out what wires are needed (or not needed) to connect to the vehicle. 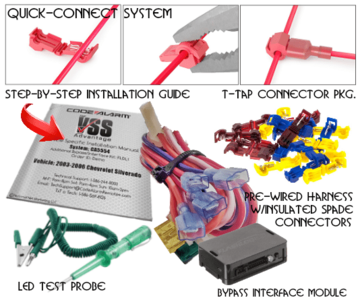 Each of our VSS system's include a step-by-step, vehicle specific installation manual that indicates exactly what wire from the system connects to what wire in the vehicle, where the wire is located in the vehicle and how to confirm that you found the correct wire using the VSS kits supplied LED style test probe. No need for using awkward multi-meters that indicate voltage level's that can confuse polarity readings and require the use of two probes and a bare spot on the wire in order to take a reading. 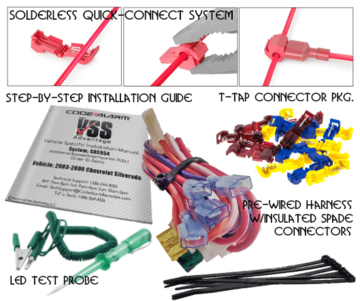 Each of our VSS kits includes an easy to use LED style test probe to use along with the VSS kits step-by-step vehicle specific installation manual. This test probe simplifies the procedure of finding and testing for the correct wire in your vehicle by lighting a green or red LED to indicate the target wire's polarity (explained in each step of our vehicle specific install manuals). For example, if the step in the VSS guide indicates that the vehicle's parking light wire is a solid blue wire found running into the rear of the vehicle's headlights switch and will show a positive polarity when the parking lights switch is turned on, you simply connect the probes alligator clip to chassis ground, stick the tip of the probe thru the wire's insulation and turn the vehicle's parking light's ON & OFF a few times, and if its the correct blue wire, it will light the red LED in the handle of the test probe at the same time the switch is turned ON & OFF! (again, explained in each step of the VSS manual). It just can't be made any more simpler than this! 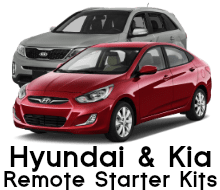 No need to give up one of your vehicles keys (or purchase a 3rd key) in order to install a remote car starter in your vehicle like with most other remote starter kits. The NKR bypass kit included with a VSS system only requires your vehicle's keys for programming, not operation, meaning you don't have to stick one of your keys in a box! The majority of vehicles on the road today have some type of anti-theft system installed on them from the factory, this can range from the transponder key type typically found in (but not limited to) most Ford, Chrysler/Dodge, Honda and Toyota vehicles to one of several versions of a Passlock system found in most vehicles manufactured by General Motors. When a vehicle is equipped with a factory anti-theft ignition system, an additional bypass interface kit is necessary to install any brand of remote starter system. After ordered, our technicians will know what is required for your specific vehicles installation and include it in with the system. Dedicated input used when installing the additional bypass interface kit required for most vehicles on the road today equipped with factory installed anti-theft systems. This plug-in port eliminates any wiring needed between the remote starter module and the bypass kit (bypass/interface kit included. Wiring between the bypass interface and vehicle required). Designed to eliminate the need to run a wire out under the hood to connect to the vehicle's tachometer wire and then having to program the tach signal to the remote starter system: The tachless mode monitors the vehicle's voltage levels, current and crank time everytime the vehicle is started with the keys and during remote start to maintain a trouble-free remote starter activation. Applicable to newer and well maintained vehicle's with gas or hybrid engines only. No matter what type of power door lock circuit your vehicle is equipped with the system will include the needed component. Many vehicles on the road today have what is known as a "data-type" or "multiplexed" power door locking circuit. This means that the vehicle is not equipped with conventional positive or negative triggered wiring that can simply be tapped into when installing an aftermarket keyless entry system. When a vehicle is equipped with this type of power door locks circuit an additional interface kit is necessary to install any brand of keyless entry system. Additionally, many older vehicles can require an additional 5 -wire relay adaptor with or without resistors, no matter what type of power door lock circuit your vehicle is equipped with the mandatory component will be included with the kit. To avoid the inconvenience of getting into the middle of an installation and finding out that you need to stop and run to the auto parts store for a relay or radio shack for some resistor's or whatever, we include any needed extra relays w/harness (for example, for power trunk activation, 3rd Accessory etc.) and/or diodes, resistors, voltage inverters, etc. needed for your specific vehicle. You will be asked to indicate the year, make and model of vehicle the system will be installed into during ordering. If in the rare event that one of our technicians finds that the system is not compatible to your specific vehicle, we will immediately contact you, void the order and promptly release your payment. Have access to some of the most qualified technicians in the industry, 7 days a week. Providing technical support since 2002, each member of our technical support staff has a minimum of 10 years of hands-on experience installing alarms, keyless entry and remote car starter systems. And with one of the largest support networks in the industry, our technicians can be directly contacted via phone, email, through our massage board, support forum and even by txt. With our wide-range of communication options, if you ever have a problem or question you can feel confident that you can easily contact someone in our technical support department.